I love to bake and I love kitchen gadgets. I am always on the lookout for things to make my baking a bit easier and consistent. One of the problems I have had is getting my sugar cookie dough to the right thickness. I have a serious issue with rolling dough the same throughout. It usually ends up thick in the middle and thin on the ends which results in cookies that are sloped and don’t bake evenly. Thankfully, just before we were buried under snow, I got the best kitchen gadget I have received in a long time. Meet the Joseph Joseph rolling pin . This little beauty is the Cadillac of rolling pins. 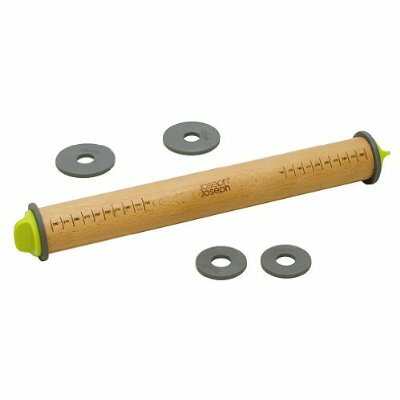 It is made of solid beech and has adjustable rings to help you roll your dough out evenly. The disks come in sizes 1/16-, 1/4-, and 3/8-inch or 2mm, 6mm, and 10mm for our metric friends. You simply slide the chosen disk onto the green knobs and screw them into the wooden pin ends. I have used both the 3/8″ and the 1/4″ disk for making sugar cookies. It rolled evenly every time and turned out perfect dough depth. It was also easy for the Geekette to use. Clean up was a snap. I highly recommend this rolling pin. It might be the last one you ever buy. ← Happy National Weatherman’s Day! You can also get similar rings for rolling pins at craft stores. However, I found that using 2 bamboo skewers of various thicknesses laid out on both sides of my dough did the same thing for less money. They are also better for the environment. Plus, you can easily replace them if you lose one.